BOX OFFICE - SARKAR GETS A SPECIAL OPENING VERDICT - 1ST TIME EVER!!!! Vijay's Sarkar was given a massive release all across the southern part of India on November 6th (Tuesday). The film grossed a record amount on Day 1 and held on admirably on the successive days till yesterday (1st Sunday). At the end of its first 1st weekend (6 days), the gross in Chennai is an approximate ₹10.72 crores. This is a historical magical opening week figure that no film has ever managed to collect to date. Slight inflation in the ticket price over the recent past has helped Sarkar to an extent but one should still not take away the credit that the film deserves. Trade experts believe that the favorable release time with no notable opposition and the strong buzz-generating marketing campaign done by the Sarkar team were key factors in these record numbers. This is a remarkable achievement indeed and Behindwoods has honored Sarkar with a special opening weekend verdict. It becomes the first film to get Mega Grand Opening in Behindwoods Box Office Report. 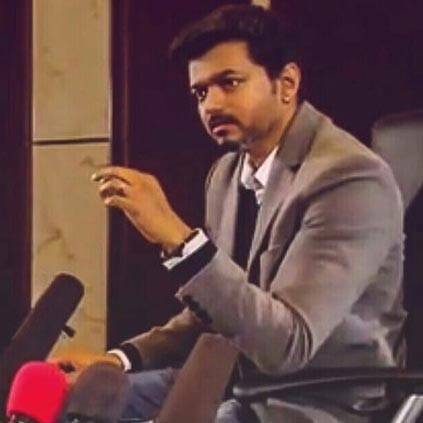 SARKAR CONTROVERSY: "Thalapathy Vijay INCOME TAX கட்டுனாரா எதுக்கு காமிக்கும்"
Thalapathy-ன் SARKAR CUT-OUT நாசம்: VIJAY ரசிகர்கள் ரத்தக்கண்ணீர்! People looking for online information on AR Murugadoss, AR Rahman, Sarkar, Vijay will find this news story useful.